Well what do we have here? This certainly doesn’t resemble your average automobile from 1974. It’s always interesting to see what cars people decide to build replicas of… but this car isn’t even a replica. It’s doesn’t look like any singular early 1900s car. It’s just a “modern” version of an old car. Albany was founded by Bryan and David Shepherd and their little convertibles were available from 1971 through 1997. Over 110 were built by the end of the 1970s. This car is based on Triumph mechanicals and uses a donor 1.5-liter straight-four. 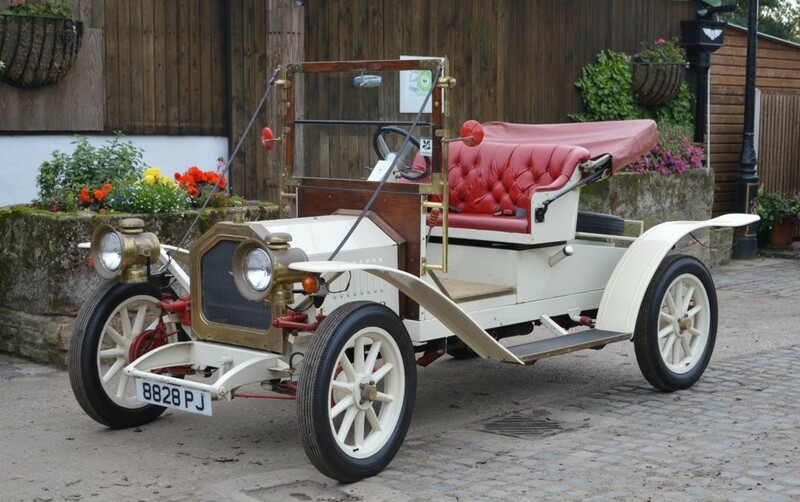 It’s Edwardian motoring with modern convenience (well a 1970s Triumph is probably just as reliable as a car from the 1900s). This car represents a very affordable way to get into old cars, with a pre-sale estimate of $10,500-$13,750. It’s simple to use and you’ll be the only one at your local show in one. Click here for more info and here for more from this sale. This entry was posted in Uncategorized and tagged 1974, albany, auctions, brightwells, cars, classic cars, convertible, replica, triumph by classiccarweekly. Bookmark the permalink. Have one in British Racing Green. Americanized. Where in the world did you get it? A lady purchased it from the dealer in Oregon. She lived in New Mexico. Moved to Houston. My Dad bought it from her in the early 1980’s and had it ever since.